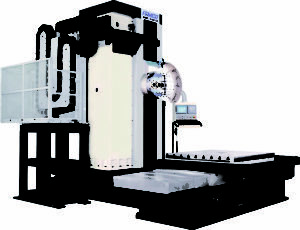 FEMCO BMC-Series is a full line of Horizontal Boring Mills with 10 distinctive models. 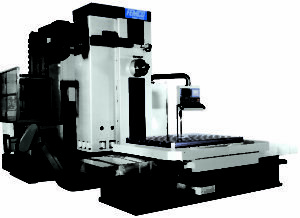 Featuring full 4th Rotary Axis tables; heavy table load capacities; extended reach of W-Axes. Each model provides specific capabilities for machining of large, complex parts. T-Type Traveling Column High Speed CNC Horizontal Boring & Milling Machine ideal for machining large molds as well as large aluminum parts. With an astounding table load capacity of 44,000 Lbs., and a 50 Taper Spindle, the BMC-100HT can handle the largest of steel molds. The Automatic Pallet Changer (APC) is an integral part of this compact CNC Horizontal Boring & Milling Machine with built-in Programmable U-axis Facing and Profile Turning Head. The U-Axis allows for intricate contouring of inside and outer diameters and is ideal for machining of complex valves pumps, gearbox housings, as well as tube and joint end preparation. 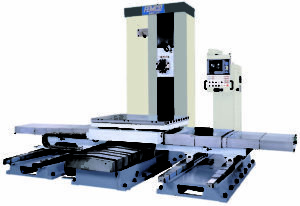 The BMC-110FR1 comes standard with a 50 Taper, 35 HP Geared Head Spindle; Full B-Axis Rotary Table; linear scales on X, Y & Z-Axes; chip conveyor; a Fanuc CNC control, and for added capability, also incorporates a W-Axis Bar for deep boring. T-Type Traveling Column CNC Horizontal Boring & Milling Machine with built-in Programmable U-axis Facing and Profile Turning Head. The U-Axis allows for intricate contouring of inside and outer diameters and is ideal for machining of complex valves, pumps, gearbox housings, as well as tube and joint end preparation. 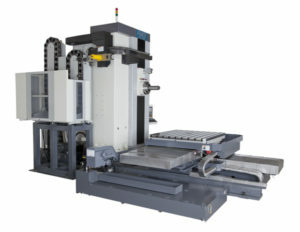 The BMC-110FT2 comes standard with a 50 Taper, 35 HP Geared Head Spindle; Full B-Axis Rotary Table; linear scales on X, Y & Z-Axes; chip conveyor; a Fanuc CNC control, and for added capability, also incorporates a W-Axis Bar for deep boring. T-Type Traveling Column CNC Horizontal Boring & Milling Machine with built-in Programmable U-axis Facing and Profile Turning Head as well as an extended X-Axis travel of 118.1”. The U-Axis allows for intricate contouring of inside and outer diameters and is ideal for machining of complex valves, pumps, gearbox housings, as well as tube and joint end preparation. 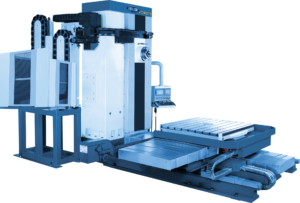 The BMC-110FT3 comes standard with a 50 Taper, 35 HP Geared Head Spindle; Full B-Axis Rotary Table; linear scales on X, Y & Z-Axes; chip conveyor; a Fanuc CNC control, and for added capability, also incorporates a W-Axis Bar for deep boring. 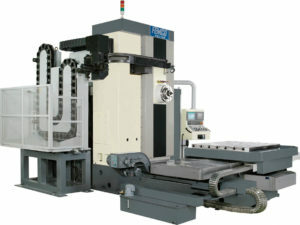 T-Type Traveling Column CNC Horizontal Boring & Milling Machine with built-in Programmable U-axis Facing and Profile Turning Head as well as an extended X-Axis travel of 157.5”. The U-Axis allows for intricate contouring of inside and outer diameters and is ideal for machining of complex valves, pumps, gearbox housings, as well as tube and joint end preparation. 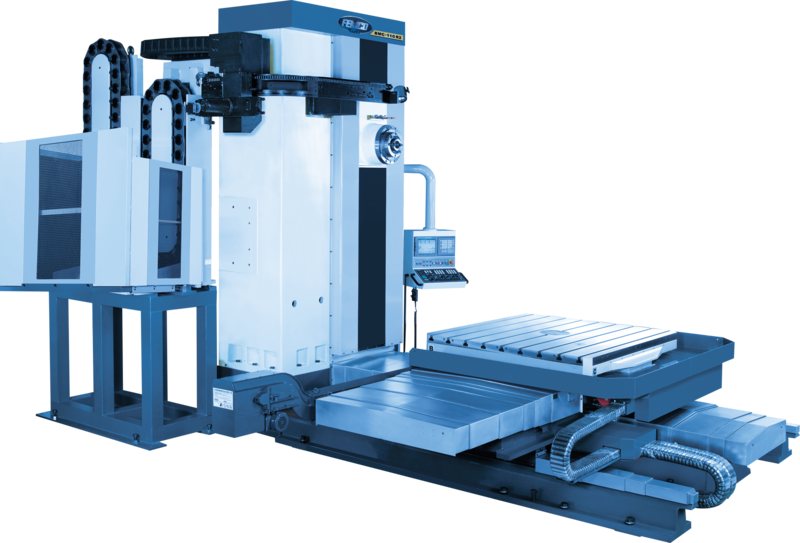 The BMC-110FT4 comes standard with a 50 Taper, 35 HP Geared Head Spindle; Full B-Axis Rotary Table; linear scales on X, Y & Z-Axes; chip conveyor; a Fanuc CNC control, and for added capability, also incorporates a W-Axis Bar for deep boring. CNC Horizontal Boring & Milling Machine comes standard with a 50 Taper, 35 HP Geared Head Spindle, Full B Axis Rotary Table, linear scales on X, Y & Z, chip conveyor and a Fanuc CNC control. The BMC-110R2 W-Axis Bar stroke is 19.69” and has a robust diameter of 4.33”. CNC Horizontal Boring & Milling Machine comes standard with a 50 Taper, 35 HP Geared Head Spindle, Full B Axis Rotary Table, linear scales on X, Y & Z, chip conveyor and a Fanuc CNC control. The BMC-110R3 has an extended X-Axis travel of 118.1” and incorporates a W-Axis Bar stroke of 19.69” with a robust diameter of 4.33”. Heavy duty T-Type Traveling Column CNC Horizontal Boring & Milling Machine comes standard with a 50 Taper, 35 HP Geared Head Spindle; Full B-Axis Rotary Table; linear scales on X, Y & Z-Axes; chip conveyor; a Fanuc CNC control. The BMC-110T3 has an extended X-Axis travel of 118.1” and incorporates a W-Axis Bar stroke of 19.69” with a robust diameter of 4.33”. Heavy duty T-Type Traveling Column CNC Horizontal Boring & Milling Machine comes standard with a 50 Taper, 35 HP Geared Head Spindle; Full B-Axis Rotary Table; linear scales on X, Y & Z-Axes; chip conveyor; a Fanuc CNC control. The BMC-110T4 has an extended X-Axis travel of 157.5” and incorporates a W-Axis Bar stroke of 19.69” with a robust diameter of 4.33”. Heavy duty, large capacity CNC Horizontal Boring & Milling Machine comes standard with a 50 Taper, 35 HP Geared Head Spindle, Full B Axis Rotary Table, linear scales on X, Y & Z, chip conveyor and a Fanuc CNC control. The BMC-135R has an extended X-Axis travel of 94.49” and incorporates a long W-Axis Bar stroke of 35.43” with a very robust diameter of 5.31”. Heavy duty, large capacity T-Type Traveling Column CNC Horizontal Boring & Milling Machine comes standard with a 50 Taper, 35 HP Geared Head Spindle, Full B Axis Rotary Table, linear scales on X, Y & Z, chip conveyor and a Fanuc CNC control. The BMC-135 has an extended X-Axis travel of 118.11” and incorporates a long W-Axis Bar stroke of 35.43” with a very robust diameter of 5.31”. Heavy duty, large capacity T-Type Traveling Column CNC Horizontal Boring & Milling Machine comes standard with a 50 Taper, 35 HP Geared Head Spindle, Full B Axis Rotary Table, linear scales on X, Y & Z, chip conveyor and a Fanuc CNC control. The BMC-135TN has extended travels of 118.11” in the X-Axis and 98.42” in the Y-Axis as well as the long W-Axis Bar stroke of 35.43” with the very robust diameter of 5.31”. Heavy duty T-Type Traveling Column CNC Horizontal Boring & Milling Machine comes standard with a 50 Taper, 35 HP Geared Head Spindle; Full B-Axis Rotary Table; linear scales on X, Y & Z-Axes; chip conveyor; a Fanuc CNC control. 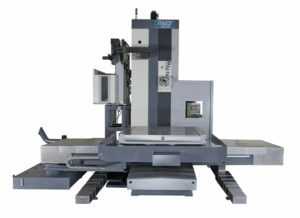 The BMC-110T2 has a unique W-Axis Ram with a stroke of 27.56” and a large diameter of 9.54”.